Back in April, Integrity Toys broke with tradition and released a sketch of a doll that was purportedly an indication of the theme for this year’s convention. See original blog post here. I admit…I was one of those that paid attention more to the sketch than the reference to the movie on this one. I was thinking Eugenia was going to be brunette. 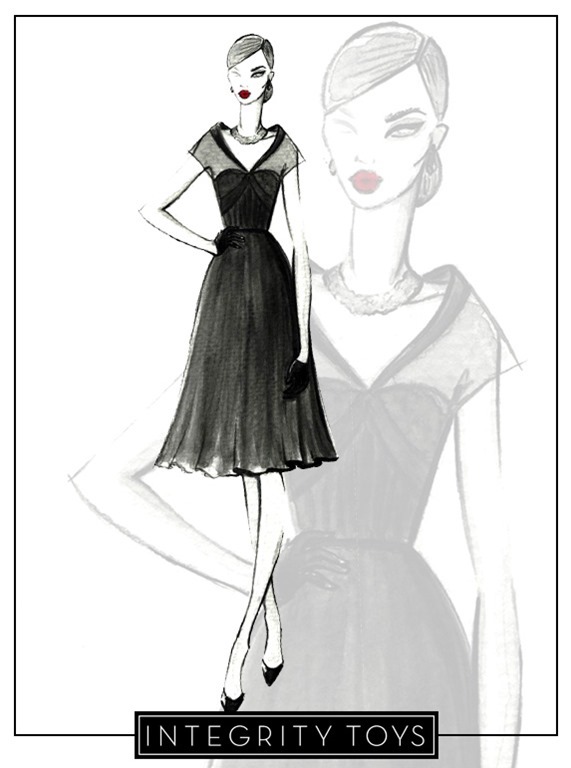 Well “Duh” Rebecca…the actress this design was channeling was Grace Kelly! Grace, is blonde. Guess I should have known. Other than the fact that this is the third blonde in a black dress from IT this month, I LOVE her. Even though I am kind of disappointed in the blonde version ( would have preferred raven on this one), I am still buying. I will immediately switch out the silver necklace for pearls but the dress is out of the park gorgeous. No information was released about skin tone on this one but she looks to be either Japan or Cream to me. Will have to wait and see. This entry was posted on September 24, 2015 by raberry65. It was filed under Eugenia, Fashion Royalty and was tagged with 2015 Cinematic Convention Upgrade, Cinematic Convention, Eugenia, FR2, Integrity Toys 2015, IT convention, Reigning Grace Eugenia Perrin. I think we all expected her to be dark haired from the sketch. I was kind of surprised when I saw her release pics. Still pretty, I’m glad I I got her. Eager to see the rest of the Cinematic Convention dolls. would have passed on one of them. Judging by her hands, I think she has cream skintone. IT still utilize big original FR2 hands form the cream skintone body dolls. Awww, the convention’s around the corner. Please, enjoy every minute of the event. I wish I could make it to the convention this year. I can imagine, it’s going to be fabulous!